Just a quick update after the postie dropped two rather heavy envelopes onto the doorstep of Nerd Towers this morning. The first parcel contained three 5v miniature stepper motors. These are really nice, and came from China in about 5 days. At £1.99 each with no extra p&p these could just be the bargain of the month! 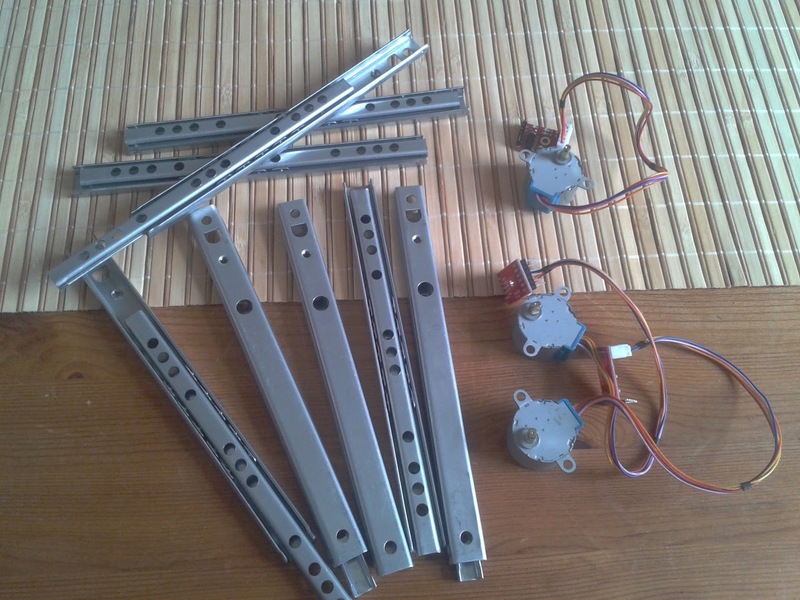 Also shown in the photo above are some drawer rails from eBay. 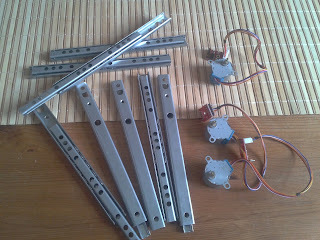 These are replacement parts for the kind of mechanisms commonly found in IKEA and MFI type flat-packed furniture. We got the 175mm lengths. About half of the runners run really smoothly and require little effort to push from one extreme to the other. About half have a little “sticky point” somewhere along their length. It’s not an insurmountable problem, and our geared steppers should be more than enough to drive a platform mounted on these, but we’re going to pick the four best/most freely running to use on our CNC drilling machine. At £8 for ten off eBay, we’ve so far blown £14 of our £50 budget (we’re going for the new build design to begin with, then see which parts we can swap out for salvage in a later version). Some laser cut acrylic, hot glue and bolts should see us with a working gantry in no time….